There’s nothing like a good cold soup in the summer. My mom’s version of tomato-based gazpacho is wonderful. We like it so much that we bring a large jar along on road trips. It’s like salad in a soup. 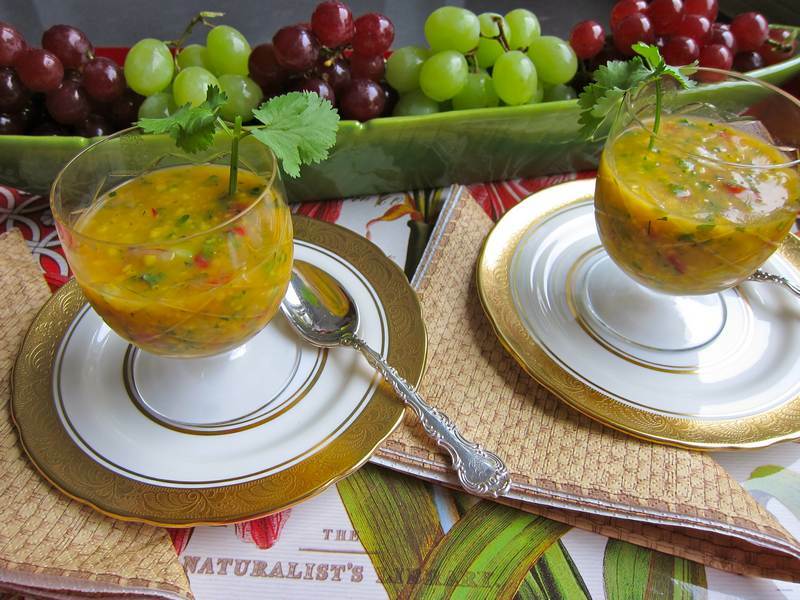 This Mango Gazpacho is like mango salsa transformed into soup. It’s a combination of sweet, spicy and crunchy, with a summery aroma. Blend mangoes, orange juice and oil in a blender or food processor until puréed. Add remaining ingredients to purée. Season with salt and pepper. Refrigerate until ready to serve. You can use store-bought orange juice, but these freshly squeezed oranges were outstanding in flavour. For our main dish, my son whipped up Food.com’s Baked Breaded Cod, using half the mayonnaise called for, and it was outstanding. Homemade breadcrumbs from frozen, leftover onion bread. Mmmmmm. Can you please advise how many servings this recipe makes? Serves 6, unless you serve it at a pot luck in mini-portions, in which case it could serve 12. This looks delish……………… Can’t wait to try it.